Appearing on the Alex Jones Show earlier in the week, pastor Lindsey Williams said that gases — Hydrogen Sulfide, Benzene, Methylene Chloride, and other toxic gases — pose a greater risk to human health than the presence of oil washing up on Gulf of Mexico beaches. Williams said the EPA is not reporting on the amount of gases escaping from the BP oil gusher. 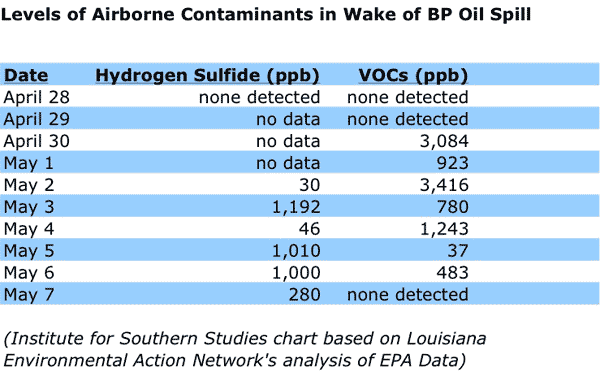 However, the second video below suggests the EPA has released data on the amount of Hydrogen Sulfide and Benzene in the air in Louisiana. On May 14 WWLTV in New Orleans ran a report on the levels of Hydrogen Sulfide and Benzene in the air at that time. 5-10 parts per billion is the established allowable amount for Hydrogen Sulfide. WWLTV reported that on May 3 the level was recorded at 1,192 ppb. Pastor Williams said his sources report the level detected in the Gulf at 1,200 ppb and the amount poses a serious and even fatal health risk. “The media coverage of the BP oil disaster to date has focused largely on the threats to wildlife, but the latest evaluation of air monitoring data shows a serious threat to human health from airborne chemicals emitted by the ongoing deepwater gusher,” the Institute for Southern Studies blog reported on May 10. Today the Louisiana Environmental Action Network released its analysis of air monitoring test results by the Environmental Protection Agency. The EPA’s air testing data comes from Venice, a coastal community 75 miles south of New Orleans in Louisiana’s Plaquemines Parish. The findings show that levels of airborne chemicals have far exceeded state standards and what’s considered safe for human exposure. For instance, hydrogen sulfide has been detected at concentrations more than 100 times greater than the level known to cause physical reactions in people. Among the health effects of hydrogen sulfide exposure are eye and respiratory irritation as well as nausea, dizziness, confusion and headache. The concentration threshold for people to experience physical symptoms from hydrogen sulfide is about 5 to 10 parts per billion. But as recently as last Thursday, the EPA measured levels at 1,000 ppb. The highest levels of airborne hydrogen sulfide measured so far were on May 3, at 1,192 ppb. Prolonged exposures at lower levels can lead to bronchitis, pneumonia, migraine headaches, pulmonary edema, and loss of motor coordination. Do you think BP will address this serious health issue? The corporation will not even allow the media to report in oil washing up on beaches. Government and corporations are not in the business of protecting our health. Corporations are in the business making as much money as possible and government is in the business of making sure corporations make as much money as possible. The health and welfare of the American people does not figure into the equation.